This was one of many Victorian houses Tapco HomeDry has eradicated damp and wood rot from, in Winchester, Hampshire. We were instucted by our clients to carry out a full damp and timber survey at the end of terrace property, which because of its poor condition, was unoccupied. It was obvious to our qualified damp and timber surveyor that there were problems because it smelt damp, wall paper was peeling and floors were springy. 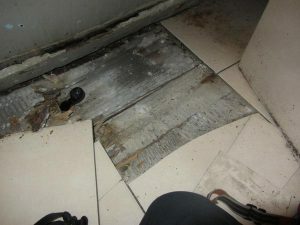 Several floorboards were lifted to expose sub-floor timbers and it was confirmed that many of the flooring timbers had rotted with wet rot and infested with woodworm. Some of the skirting timbers were also rotted, due to the damp walls. Moisture readings taken using a calibrated damp meter recorded very high levels of moisture which was diognosed as Rising Damp. An inspection was carried out externally where it was found that the sub-floor ventilation was inadequate and the property had many building defects, which we were informed were to be carried out by our client, the main contractor. Following instructions from our clients our experienced operatives attended the property and immediately proceeded to remove the rotted timbers and damp wall plaster and taking it to a designated place for disposal. A chosen masonry joint at the base of all walls was pattern drilled, the holes were cleared of dust and injected with a Silane/Siloxane cream damp proof course at the approved rates. The walls were then prepared and plastered in accordance with our damp proofing specification. All of the flooring was replaced using new pre-treated timber and the skirting boards were primed and replaced, to be decorated by the main contractor. Six additional air-bricks were installed to increase the flow of air beneath the floors. Damp Proofing and Timber Rot treatment, including woodworm and Dry Rot, is covered by our very established 20 Year Guarantee and protected by Guarantee Protection Insurance (GPI). Like our client, make sure your damp proofing and timber preservation is only carried out by a member of the Property Care Association (PCA).